I have had 4 Bernina sewing machines since 1985. The most recent was the 630 with the BSR (Bernina Stitch Regulator). This stitch regulator was the main reason I upgraded to this model. I loved this machine until I saw the Baby Lock. Fell in love on the spot. The Baby Lock Ellisimo comes loaded with stuff and I mean loaded: straight stitch and zig zag stitch plate, walking foot, too many feet to list, 2 bobbin cases etc. I thought I would never own any other machine except a Bernina. Sadly I never got the hang of the BSR to satisfy myself. I feel I have far more control with the Ellisimo. The few feet that I have purchased for it (1/4" quilting foot) was half the price of the comparable Bernina foot. The stitch quality is excellent. The pivot function and auto threader is absolute magic. This is the machine of my dreams and half the price of the newest Bernina. I shouldn't forget to mention the beautiful embroidery my Baby Lock does, too. Emily, this sounds like a great sewing machine. For those of you unfamiliar with the Ellisimo, I gathered up some of the most pertinent information as it relates to quilters. However, you should be aware that this machine is also a superb embroidery machine. If you watch the video further on down the page, that will become crystal clear. LCD Screen: This is a big one, measuring 8-1/2 on the diagonal. Your instruction manual is loaded in the machine's computer...you'll never have to hunt for it again...along with 11 instructional videos. THAT is slick. Lots of other goodies come along with using this screen, many related to machine embroidery. Stadium Lighting: Sewing machine manufacturers are getting wise to the fact that lighting is very important. Baby Lock calls their improvements 'Stadium Lighting'. They have added more lights and upgraded the quality of them to brighter LEDs. The entire space under the arm of the machine is lit. 682 Stitches to Choose From: 'nuf said. We quilters are dazzled by lots of stitches. This includes 79 decorative satin stitches...great for embellishing the edges of fusible applique. 3 USB Ports: Enough to load your machine embroidery designs from other sources as well as adding a mouse for ease of use to manipulate those designs. Variable Speed Control: This is really helpful for free motion machine quilting. For many the ability to stitch a a consistent, reduced speed increases control of the quilt sandwich. 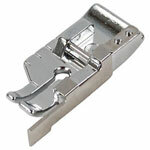 (As a quilter, I would recommend purchasing the open toe foot (ESG-OT) for machine applique ) for machine applique and paper piecing) and the 1/4 inch Quilting or Patchwork Foot with Guide (ESG-QGF) for piecing. To read about what features quilters must have on their sewing machines, read our article "The Best Sewing Machine for Quilting is..."
We value the opinions of our readers. You can add yours by taking part in this on-going 'Sewing Machine Survey' that starts close to the bottom of that page. We hope you will take a minute to participate! Do you have an Ellisimo? Let us know what you think about it using the 'comment' link below, or if you prefer, write your own review. Thank you for sharing. Emily, happy quilting and embroidering with your machine! You are in for some good times! For more information you can view and/or print Baby Lock's Ellisimo brochure. Just a quick note...If any of the links on this page aren't working, please let me know via my Contact Us form. I'll do my best to either correct the problem. I got my machine in 2011. I absolutely love it. My first was a Bernina 200 upgraded for the BSR. Which I really like. But my Ellisimo is so wonderful. Thank you BabyLock. I LOVED my Ellisimo Gold II. I upgraded to version III then just upgraded to The Destiny. Do you know anywhere I can locate the files, especially those 2 sets. I love the Destiny but I loved those files, too. I wish I could provide a definitive answer. Unfortunately, the best I can do is recommend you contact either Babylock directly or your local dealer. The other option is to locate one of the Ellisimo groups on Yahoo. I suspect that others are in your same position and may have found the solution. Again, I wish I could be of more help. I've owned my Ellisimo for approximately two years now. It has all three of the upgrades installed and many of the optional feet. There are many things about this machine that I love - the auto needle threader is one of the best-loved and most appreciated features for me - as well as the precise positioning (sorry, Pfaff) I achieve with the built-in camera feature. The 3rd upgrade - border hoop - is wonderful for blankets, quilts, and extra-long designs in general. This is the most user-friendly machine on the market, along with its sister product, the Quattro. I'm not a "brand" chaser, as I look for features important to me, product reliability and durability, and stitch quality. I currently own Pfaff, Bernina, Babylock, and Janome/New Home machines. I've been an avid garment seamstress for over 35 years, and also enjoy thread painting and landscape quilting. Now, with all that said, do I love my Babylock Ellisimo? No, even though I really, really want to! I do love the needle threader, however. Why don't I love my Ellisimo? Because it has the poorest stitch quality of all my machines. This goes for embroidery, as well as everyday stitches. Before I bought it, I joined two Babylock Ellisimo Yahoo Groups to "lurk and learn" all the things the owners enjoyed or hated about their machines. After a year or so, I simply had never read anything negative about this machine. Everyone LOVED the Ellisimo and raved on and on about its wonders. In the meantime, I was happily sewing and quilting on my older Pfaff 2140/70 and my Bernina 200/730, both of which have absolutely gorgeous embroidery and stitch quality to this day. I don't know if it's just my machine or what. Is the stitch quality really all that bad or am I just spoiled by the quality of the older Pfaff and Bernina machines? I've taken samples of how my Ellisimo stitches out, and everyone agrees that it could stand some improvement. The dealer says that there's nothing mechanically wrong with the machine, so I'm at a loss. Anyway, if you're looking for the most user-friendly machine on the market, then go for it (or the Quattro). If I had it to do over, I'd go with the Quattro because it has the built-in ability to design customized stitches and the Ellisimo does not. I want a candlewick stitch something fierce and can't get it on my Ellisimo unless it's in an embroidery design. I'd just like to select it from the built-in stitches and sew it as any other decorative stitch...not happenin' with the Ellisimo. My only caution, based on my experience, is to sit down with the machine and watch it embroider out a design of your choosing. Make sure you're thrilled with the stitch quality using the threads you like to use, not what the dealer uses. ...I really do want to love my Ellisimo...honest! I would like feedback on the two machines. I purchased the Elliago several years ago and I would like feed back on the new Ellismo. Is there a big difference and is it user friendly? Are there more features etc, etc? Ladies, I look forward to hearing from you. P.S. I will find this page to see comments. This is my first time on this site. Today I tried using the free motion function on my Ellisimo and it was great. Slower than using a long arm, but it did a great job. This is a wonderful sewing machine! I have only had my machine for 1 month and I absolutely love it. It is so user friendly and a pleasure to sew on. 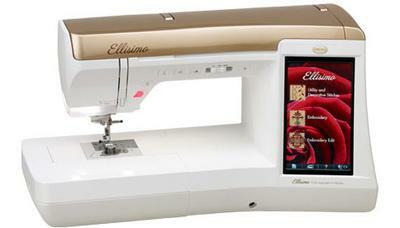 I traded a Bernina 830 - top of the line - for the Ellisimo. The Bernina was giving me too many problems. Even though I lost money on the deal, I can truly say this was a good move. Love, Love, Love it! I am in the process of taking the lessons and they are really good also. What a truly great machine. I am enjoying sewing again after struggling with the Bernina 830.